There will always be John Robie, le chat. 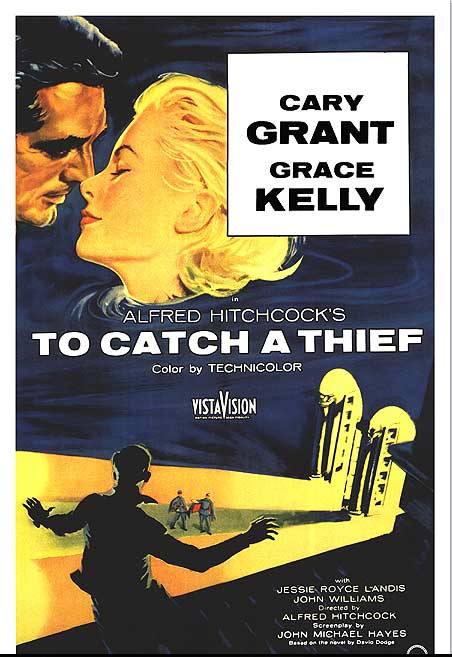 But Cary Grant as a reformed thief in Alfred Hitchcock’s “To Catch a Thief” is a tough act to follow. That won’t stop Hollywood from trying. With Heath Ledger’s swansong as The Joker liable to garner some sort of special Academy Award for creepiest villain ever, I begin to wonder, who would be your vote for today’s most elegant rogue? Just off the top of my head, I’d say the choices come down to two: Pierce Brosnan as Thomas Crown and Matt Damon as Tom Ripley. I will also make the case that the talented Mr. Ripley is a better role model. Yes. But only because Patricia Highsmith’s intention in creating Tom Ripley was to create the average Joe, the boy next door, who happens to be completely amoral. Then, she gives him a charming façade. Dexter, he isn’t. Mr. Crown is a self-made, multimillionaire businessman (with a mischievous streak.) A goal that many of us would like to achieve and few of us will attain. And, as Cary Grant was, Pierce Brosnan is ridiculously handsome. Short of cosmetic surgery, few of us can hope to look half as good. 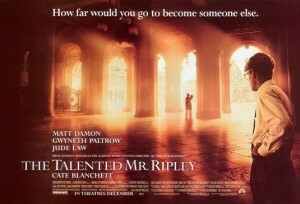 No, Tom Ripley must be our man. I can’t, of course, condone his manners. Murdering one’s host is completely beyond the pale. Mr. Ripely’s got my vote. Pull out the DVD and skip ahead to chapter 14 (in which he learns the value of a good exchange rate) or 17 (Christmas, and he gets just what he hoped for), watch as Matt Damon assumes the identity of his late friend and tell me what you think. Any votes for Thomas Crown? Any votes for Danny Ocean? This entry was posted in Elegantology and tagged Alfred Hitchcock, Cary Grant, Matt Damon, Pierce Brosnan, The Talented Mr. Ripley, The Thomas Crown Affair, To Catch a Thief. Bookmark the permalink. Umm . . . isn’t it pretty much accepted that Highsmith is using Ripley to condemn exactly that which you find commendable in him? For Ripley, the things you mention are indicia of class — he has none, and therefore hungers after it. That he so easily mimics them is — to my reading — a commentary on the artificiality of class distinctions. This emphasis on artificiality is carried on in the later books where, as you note, he becomes an art dealer . . . of forgeries. And why does he murder? To preserve his hard-won class status (i.e., when he’s about to be revealed as a striver). In this context, Ripley’s “ceaseless quest to live an elegant existence” is hollow, since the “elegance” Ripley seeks is hollow, and it is precisely his hunger to preserve it which leads him to murder. The only thing that keeps us rooting for him is how contemptible and undeserving the rich folks are. For all of his faults, Ripley is nothing if not a hard worker. With that in mind, yes, I’ll give a vote to Danny Ocean. Danny seeks revenge more than wealth, and accomplishment more than baubles. He is a social criminal rather than a sociopath — he cannot and does not work alone. Sure, the things he does are much more outlandish and unbelievable than Ripley’s acts, but that’s the kind of movie it is. The commentary in Ripley is more spot-on, but for the purposes of the question you pose, it’s gotta be Danny Ocean. Jonathan Rhys-Myers in Match Point. This is the contemporary equivalent of Ripley — the striver who will murder to preserve his social position. Alec Baldwin in 30 Rock. You heard me. Rogue? Check. Elegant? His response to Liz Lemon when she asks him what he’s doing in a tux: a sarcastic “It’s after six. What am I, a farmer?” Check. Clive Owen as Jack Manfred in Croupier. Going back a bit, but Michael Caine and Steve Martin in Dirty Rotten Scoundrels are both elegant and roguish. Steve Martin in The Spanish Prisoner. Not exactly an iconic performance, since the movie was a total flop, but still . . .
Tag troubles in that last post. Sorry. I dunno, Blushing. Grant’s great, but Hitchcock’s direction was really lacking in that film — really just going through his bag of tricks to please Truffaut rather than telling the story and using his tools/tricks to build suspense rather than as signposts. I’ve always thought that <To Catch A Thief would be ripe for a remake, since it could be done so much better. 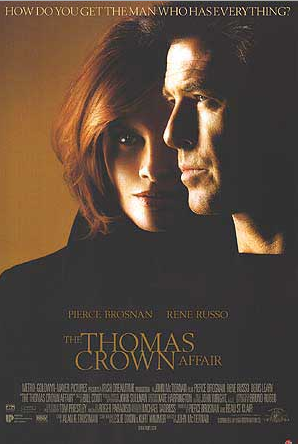 Just like Thomas Crown was better the second time around — better directed, better written, and better acted. It just didn’t have the iconic presence of McQueen in the middle of it. Which is, certainly, a loss — but not an insurmountable one. If the original was a better movie, the lack of a McQueen-like presence might have made it more difficult to re-make. After all, you don’t see folks trying to re-make Bullitt or The Great Escape or Cincinnati Kid. Bad tags again! Damn me! When Freddie confronts Ripley in the apartment– S. Hoffman’s look around is so telling. He knows the over the top kitsch of the apartment is all Ripley and nothing his friend could ever live in. Ripley has good taste? Hardly, he’d feel at home in Las Vegas. Money and good taste rarely get together. Excellent commentary C.S, and a great list; thanks. In answer to your question, yes. She parodies the “upper-class” and the social-climber, both. Ripley’s is a hollow victory. I believe that it is because he is himself a hollow man. He seeks to fill that void with beautiful things. Eventually he kills to preserve himself or over some perceived slight. But yours is a more considered reading than mine, I’m sure. I can only hope that we, who are more complete people, find substance in the beauty to which we have ready access. Form vrs. function. Is a cut crystal shaker with a polished silver top more elegant than its utilitarian cousin, the Boston Shaker? To my mind, yes. It requires more careful handling and in so doing, a more elegant set of gestures when making a drink. Are cut crystal shakers with polished silver tops available to the general public? Yes. Are they affordable? No. Is it indicative of my class that I own or want one? Or was I just lucky enough to find it second-hand and think it beautiful? Am I putting on airs by using it? And is that condemnable? Am I a snob? Probably. I prefer the company of very intelligent people of great wit who have an aesthetic with which I can agree. I mean a group of people who were educated in a certain way (generally in the liberal arts.) I know no one who was elected to Pop, let alone attended Eton, or Phillips-Andover-Exeter, for that matter. I have met those who have very refined tastes — some, even, are autodidacts — but on the whole, they are people who learned to appreciate the things to which they were exposed from an early age, through school, parents, travel, etc.. My poorly argued point is that elegance can be learned, through rigorous study and practice. That it is not only confined to those with an inborn refinement or to those of great wealth and privilege. I have been reading your blog for a while now, and this is priceless. I laughed out loud (lol, as the kids say). Congratulations on a great blog. Kudos! Tintin, I suppose I always have a bit of bad taste in me… the point is his search for elegance. I’m really going to have to get an editor… Did I mention that I majored in tautology with a minor in circular thinking? I own the 2nd Thomas Crown and To Catch a Thief, but have still not seen Mr. Ripley (or read it either), so I guess I’m due. Different period but similar theme…Kubrick’s Barry Lyndon. Charming and haunting. Almost better than Thackery’s novel dare I say. I think that Elegance is or should be organic, uncomplicated, simple and streamlined, and not draw too much attention to itself. Vulgarity draws attention to itself – either on purpose or unknowingly. Speaking of simplicity: “Concert Pianist” is the standard and quite adequate. bevglen, thanks! And agreed, to a point. Vulgarity has no place in the elegant existence. However, Fred Astaire frequently called attention to himself with his manner of dress (to say nothing of Windsor) and yet he remained elegant. Grant streamlined to call all attention to his tanned and handsome face. There are two modes to be explored here and I thank you for giving me something more to think about! Check out “Ripley’s Game”. Different actor playing Ripley but much more ruthless and elegant. Hello Steve, thanks for the comment. I actually own both and agree that Mr. Malkovich does a great job. He deadpans so well and his malevolent looks are great. “Purple Noon” is the French version with Alain Delon, Also worth a look.